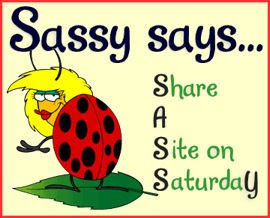 SASSY is an acronym for Share a Site SaturdaY. This is a meme intended to help share the linky love. Post links to sites you love! Wanna play along? Click on the graphic! This week I am featuring blogs by a very dear lady. I am sure that she has something for everyone! There are photos, challenges, memes, fun, how-tos, freebies, and more! Recipes, Deals, Giveaways, Cookbooks, Reviews...OMG~ Check out the Make Ahead Mashed Potato Casserole! I LOVE this blog~ We can always use an excuse to celebrate! 4. Sandy's Stories Find stories of today and days gone by... of another time... a happy life... using prompts, photos, and memories. She reviewed Scrappynhappy in Ohio here! Her journey to making money online. Please stop by and see Sandy...I promise you will be glad that you did! If you play along, be sure to get some linky love by filling in the Mr. Linky. This week, I am sharing some great goodies for your blog. Enjoy! 1. Button Maker Call it a badge, sticker, button, or whatever you'd like. Create yours below. Pick some colors, enter some text, and you'll get a button you can download for your site. 2. Button Maker, too. You see those 80x15 buttons everywhere. Our Button Maker lets you make some yourself. 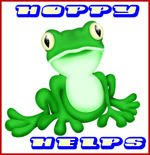 Fiddling around with Photoshop or any other graphics editor can be a pain. Make 80x15 or 88x13 buttons with a few clicks. 3. Pre-Made Buttons Lots of adorable goodies here:). 4. Bloggin Basic 101 Great tips and info. 5. Find out who links to your blog. In order to help spread the word about this meme, please let the folks know that you are linking to them by leaving a comment on their blog with a link to your post:). This week I am featuring bag patterns:). If you participate fill in the Mr. Linky and gets some linky love! I was sick and missed posting this on time. I am linking to everyone who has participated in this meme so far:). 1. Claim your blog at Technorati to find out who links to you and more. 2. Another way to find out who links to you. 3. Make friends and join communities of like-minded folks here. 5. Yep, I have a My Space, too! 1. Diane's recipes make my mouth water! 2. Kye, a friend of the family, just opened her own Etsy shop. 4. My friend, Peggy makes amazing graphics. 5. Links Around The World is something I wanna post on my main blog this week. Hope you have an absolutely wonderful week! 1. She has simplified my life. 2. God used her to saved my life.